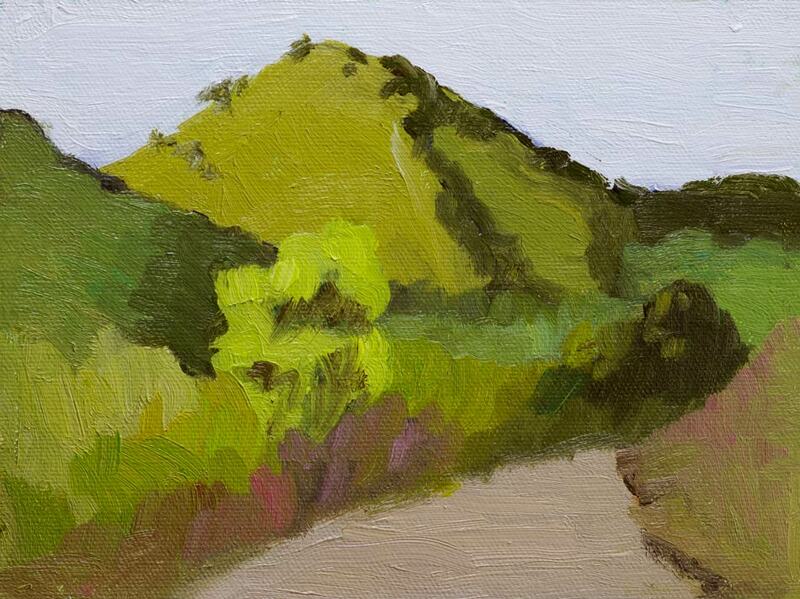 Borges Ranch View, oil on Raymar panel, 6x8"
Last Saturday my plein air group met at Borges Ranch in Walnut Creek’s Shell Ridge Open Space. It’s a beautiful place that feels far away out in the country, and is surrounded by strange, tall hills covered in a hundred shades of green. While I was painting I kept hearing the strangest sounds: yips, yelps, squeals and howls. I ruled out the sheep, goats, pigs and roosters and decided it was either the world’s most annoying beagle or a coyote. Later I asked the ranger who confirmed that there were three coyote families in the three nearby hills. He said they all have pups in their dens and are very talkative now. Want to hear a coyote? Click here to go to a site with a coyote sound clip. Now back to the painting–I tried to simplify, avoid details and focus on color, light and big shapes. The sky was completely covered in a thick layer of clouds and I noticed a painting “rule” in action: cool light creates warm shadows (and vice versa). Although the heavy cloud cover meant there weren’t obvious shadows, I could see how darker areas leaned toward red while areas in light were cooler (e.g. lemon yellow, not an orange-yellow). When I got home I broke my rule of not touching up plein air studies and fussed with it, eventually ruining it and throwing it in the trash. I’m glad I took a photo first…and that I had the joy of painting to a coyote soundtrack! Wow, now we get living sounds with your lovely paintings. You are just a barrel of fun, Jana. Good job, it was probably a great learning experience. Hoping you wiped it off to re-use! Those Raymars are obscenely expensive. Thanks. It was a good learning experience! Actually the panel was one I’d previously scraped so this was it’s second (or maybe third) incarnation. It felt like an unlucky panel that was doomed to fail so it felt good to just toss it. Yikes. I have had some like that! One in particular, felt like I should drive a stake through it before I threw it away! Good riddance! I think it is funny that you threw the panel away! Sometimes it seems like a picture just goes bad. . . I have a drawer in my flat files labeled “Why Bother”. Sometimes I look inside and fix something, and other times I just have to tear a piece up and get it gone! About coyotes – in my neighborhood when I hear them it usually means someone lost a pet. Ick. The version you posted is wonderful! Glad you enjoyed it up to that point … and there will be a wonderful next time, too, that totally works.